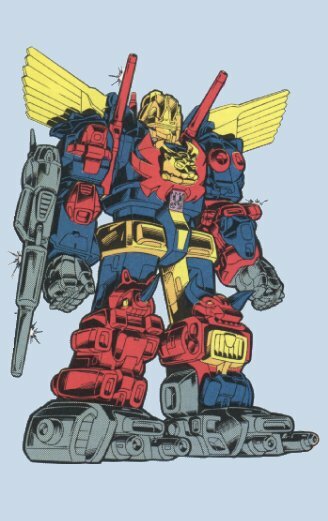 Profile: Although he's a living machine whose thoughts are dictated by a mass of microprocessors and logic centers, all of Predaking's actions seemingly result from swift, savage, animal instinct. The five Predacons - Razorclaw, Rampage, Tantrum, Divebomb and Headstrong - who comprise Predaking blend together so smoothly, their circuits integrate so seamlessly, that Predaking moves with a fierce fluidity that belies his multi-body construction. He doesn't think, he only reacts. Whether his optical sensors detect the movement of a jumbo jet or an ant, his response is the same, virtually instantaneous and usually deadly. Only other Decepticons can escape being targeted by this hair-trigger horror, and even they worry that in some instance Predaking might mistake them for the enemy. But despite the ever-present danger he represents, the Decepticons value Predaking's abilities. As a warrior he has no equal; as a weapon he has no restraints. He is the closest thing to a perfect fighting machine the Decepticons have. Abilities: Predaking is monstrously strong. He can lift 500 tons without straining a circuit. He reacts to any movement he sees within .002 seconds. He can generate a powerful electric field about himself that dampens or repels any energy-based beams and prevents other Transformers from approaching any closer than 10 feet. One punch from his fist can shatter a 50-foot reinforced concrete cube. He wields a powerful X-ray laser cannon, whose blast has the equivalent explosive force of 100 tons of TNT. Each of his feet has a double-barrelled mortar shell launcher within it.